And we thought last off-season was eventful. With the dismissal of Miami head hockey coach Enrico Blasi on Tuesday, the program faces an even more chaotic spring and summer than last year, when the RedHawks replaced both assistant coaches and had six non-seniors leave Oxford. Miami coach Enrico Blasi (photo by Cathy Lachmann/BoB). Now the status of everyone involved in the program is uncertain. For those who aren’t MU hockey diehards, let’s catch you up. The year is 1999 and Miami hires a 27-year-old alum in Enrico Blasi. He’s the youngest coach in Division I at the time. His fifth season – his first having all his recruits dressing each night – Miami qualifies for the NCAA Tournament for the third time ever. The RedHawks miss that field the following season, but for the next eight – eight! – campaigns, the RedHawks are back in the nation’s top college championship. And in 2006, Cady Arena opens at the new Goggin Ice Center, and the beautiful new home for Miami hockey is packed to the walls, sometimes exceeding its alleged capacity of 3,642. From then on, not only did the NCAA berths start becoming an annual event, the RedHawks inched closer to bringing home a national title. In 2007, Miami earned its first-ever NCAA Tournament win, 2-1 over New Hampshire. The next season, as the No. 2 overall seed, the RedHawks took out Air Force in overtime and led Boston College, 3-1 late in the second period before falling in overtime, 4-3 in the NCAA regional final. Numerous players graduated prior to 2008-09, but that spring 2009 Miami still managed to sneak into the tournament. As a four seed in their bracket, the RedHawks won the NCAA regionals, getting past Denver and Minnesota-Duluth as they headed to their first-ever Frozen Four in Washington, D.C. The success continued, as they beat Bemidji State, 4-1 in the national semifinal and advanced to the NCAA title game. We know what happened next, but many forget Miami went right back to the Frozen Four the next season in Detroit after winning an epic, double-overtime thriller over Michigan in Fort Wayne. No one knew it at the time, but that win over the Wolverines would represent the tip of the plateau that Miami had been riding. The RedHawks returned to the NCAAs the next three seasons but won just one game, a 4-0 blanking of Minnesota State in Toledo in 2013. Then in 2013-14, MU transitioned to the NCHC and the unthinkable happened. A sub-.500 record. No trip to the NCAA Tournament. It appeared that season was just a hiccup, as the RedHawks won the NCHC Tournament and earned a No. 1 seed in the Providence Regional in 2015. But that conference title game came at a huge cost, as Riley Barber was injured and Blake Coleman was assessed his third game misconduct of the season and was suspended for the NCAA opener. On top of that, Miami drew the lowest seed in the bracket – Providence – which played its home games two miles from the rink they would play in. The RedHawks lost that game, 7-5, and haven’t been back to the tournament since. They haven’t reached the .500 mark in the four subsequent seasons, and after winning 15 games in 2015-16 their victory totals since have been nine, 12 and 11. Miami’s collapse was blamed on recruiting, which was definitely a major reason. 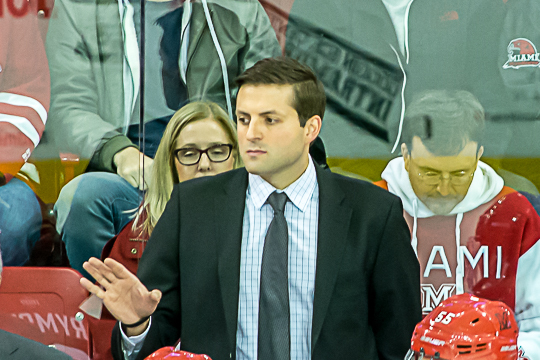 The RedHawks benefitted greatly from the players brought in by assistants Chris Bergeron and Jeff Blashill. 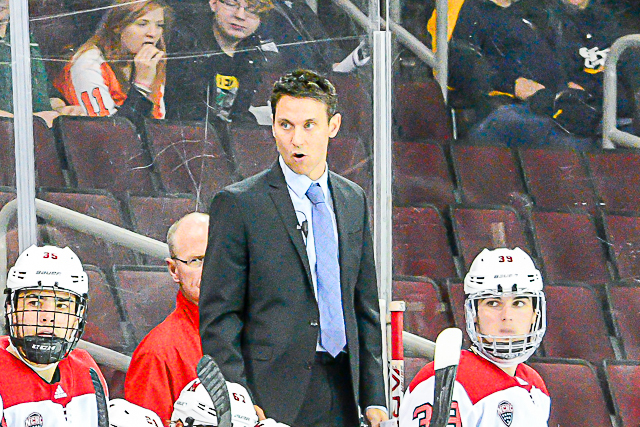 Bergeron was hired as the head coach at Bowling Green and Blashill became the head coach for the Indiana Ice of the USHL, where he continued to push quality players toward Oxford, such as Sean Kuraly and Coleman. But Blashill climbed the proverbial coaching ladder and is now the head coach of the Detroit Red Wings. That brings us to March 11, 2018. Assistants Brent Brekke and Nick Petraglia are both let go, and in the following months, Peter Mannino and Joel Beal are hired in their place. Derek Daschke and others decommitted from Nebraska-Omaha – where Mannino coached previously – and came to Miami to follow the coach that recruited them. So things are looking up heading into 2018-19, and the change behind the bench seems to pay instant dividends, as the team starts the season 7-2 and is 9-5 at Thanksgiving. A tough road trip that involved multiple canceled flights and some players arriving just shy of gametime in New Hampshire, and Miami comes away from that series with a tie and a loss. The RedHawks return home and play two of their best games of the year, coming back from a goal down six times in a pair of ties against No. 1 St. Cloud State. Off to Providence, where Miami was 0-1-1 but rebounded from a 3-1 deficit to salvage a tie in the finale. Then in Kalamazoo, the RedHawks were a little sluggish at times and lost both games by a goal. That’s eight straight without a win (0-4-4) but Miami is still playing mostly good hockey at this point and has a high collective compete level. After all, the expectations weren’t terribly high this season, but it would be good to see the team play hard and show signs it’s moving in the right direction, right? To this point, the RedHawks had. After this point, no. Duluth came to Oxford and in the series opener, Blasi ripped Mannino on the bench for a disagreement in strategy. Coincidentally or not, Miami was outscored, 7-0 for the weekend. Colorado College was the next team to visit the RedHawks, and CC picked up all six points in a 6-1 and 3-2 sweep at Cady Arena, with Blasi receiving a game misconduct and eventually a reprimand from the league for berating an official and breaking a stick on the boards during the latter game. St. Cloud State swept Miami by identical 5-1 scores the next week. Finally, after a 3-0 home loss to Omaha, the RedHawks beat the Mavericks in the series finale to snap a 15-game, 0-11-4 skid that essentially ended any chance Miami had to earn the all-important home ice advantage for the NCHC Tournament. The RedHawks pulled out a win in Denver the next Friday but would not pick up another victory, losing their last seven for a 2-18-4 post-Thanksgiving mark. To its credit, Miami played quality hockey at times during the NCHC opening round but was outskilled by No. 1 St. Cloud. What happened after such a promising start? It’s likely a combination of several of factors. The schedule got tougher after December. The frustration of the winless streak snowballed. The Mannino-Blasi bench rift. Youth. Injuries played a major role. The end result: A final record of 11-23-4. Three days after the Game 2 loss at St. Cloud State, Blasi was fired by Miami. He was under contract until 2023 but an adjustment to his contract after last season only guaranteed him one year’s pay should he be terminated. So that’s where we are now, and everyone is left to speculate about the future of Miami hockey. Let’s reflect on the Blasi legacy first. Criticism of the former coach has been whipping through cyberspace for some time, and how ever much of that is warranted no longer matters. Blasi played for four years at Miami, was a captain, a 115-point scorer and played on the first-ever RedHawks (then Redskins) NCAA Tournament game in 1993. After a short assistant coaching stint abroad, he took over the head coaching job at Miami at age 27. Again, the RedHawks went to 10 NCAA Tournaments under Blasi, including eight in a row. They went to the Frozen Four twice and the national title game once. They won the CCHA Tournament, they won multiple CCHA regular season titles. They won the NCHC Tournament in 2015. Still just 47, Blasi has 398 career coaching wins. Miami hockey may have existed before Blasi, but he took the program from fledgling to a level of excellence rarely seen in any RedHawks sport. Yes, Miami hockey has struggled in recent years but without Blasi, there’s no NCAA runs and no Cady Arena. This man belongs is one of the greats in the history of Miami sports, and when we get some distance from this tumultuous run, hopefully everyone will realize that. Blasi has either played or coached Miami hockey for a quarter century despite still being well short of 50 years old and deserves the upmost credit and respect from the hockey community. So where does that leave the coaching situation? We’re entering that pure speculation portion of the piece because probably no one knows at this point. The release from the AD said “a national search” has begun in search of the next head coach. And there’s no doubt, as John Buccigross said, that despite its recent issues that job is still a very desirable one. The NCHC is the best D-I conference by far, creating a magnet for top recruits. Miami is still a fantastic school. Oxford is still a beautiful college town. Cady Arena is still a top-notch building, and the RedHawks still have their own multi-million dollar weight room just outside their locker room, a perk very few NCAA hockey players enjoy. So regardless of who the new coach is – and my guess is it’s not going to be an obvious name familiar to the program – he should be a quality candidate. The process probably won’t drag on for too long, although if it’s someone already on a bench – pro or college – it could be held up if the ideal candidate’s season is still ongoing. Because uncertainty in the head coaching slot obviously makes recruiting exceedingly difficult. Miami assistant coach Joel Beal (photo by Cathy Lachmann/BoB). Then there’s the assistants, and here’s where Miami may have a problem. The RedHawks brought in assistants Mannino and Beal a year ago, and obviously that’s not ample time to turn a program around. But when Miami hires a new coach, he will almost certainly be allowed to pick his own assistants. The optics of that could be terrible for Miami sports overall if the athletic department is perceived as treating their coaches poorly. Both men uprooted their families to move to Oxford and unless there is an agreement in place to allow them to remain with the team regardless of the head coach, they could presently be in limbo. 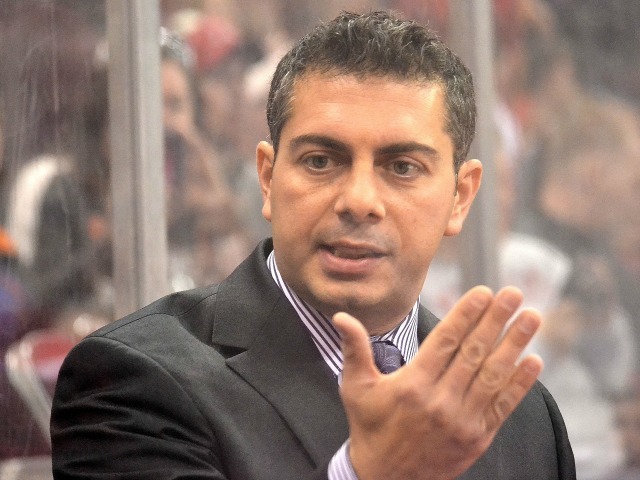 Now could Mannino be considered for the head coaching job? Absolutely. He’s an exceptional recruiter, but with only a couple of seasons as a Division I assistant, the perception is that he may not be ready for such a high-profile position. Miami associate head coach Peter Mannino (photo by Cathy Lachmann/BoB). Then there’s the recruits. Mannino and Beal have pieced together a well-reputed recruiting class for the next few seasons, but many of those potential RedHawks could bolt if the coach that sold them on Miami are not retained. There could be roster overhaul anyway, as some players could choose not to remain with the program, and – like last year – some may not be invited back by the team if they are not performing to expectations. So the question becomes: Why let Blasi go now? Miami could’ve blown the entire program up last season and started over, but at that point Blasi’s contract was still structured so that he would’ve received a lot more money, should he be relieved of duty. And Blasi was – and still is – very well respected by many at Miami, especially with his decades of service to the program and being an alum, plus with recent firings in other sports, it appeared at the time Miami hockey was deserving of a reboot. The powers-that-be know all of this, of course. So this is just a guess, but the athletic department probably intended to give the coaching staff at least a second season to right the program, but the 2-18-4 finish may have sealed all of their fates. From their perspective, paid attendance, merchandise and concession sales plus those all-important alumni dollars have been dwindling, and they may have figured they couldn’t afford to take the chance the program wouldn’t improve in 2019-20 and then having to hire in a new coaching staff anyway as their incoming revenue pool continued to dwindle. It had to be an excruciatingly difficult decision. But agree or not, the David Sayler-led athletic department expects results and will replace anyone – even a 20-year tenured coach and alum with Blasi’s credentials – who isn’t meeting those expectations. Posted on March 24, 2019, in 2018-19, Uncategorized and tagged 2018-19 miami redhawks, Enrico Blasi. Bookmark the permalink. Leave a comment.